Check out the Spring 2019 delivery schedule for Steinhauser’s Magnolia Chick Deliveries. Find directions to Steinhauser’s Magnolia location here. Check the dates below to see what types of chicks we expect and when they arrive. Note that changes can occur at any time. Please call the store to confirm delivery dates and types before heading over. Remember your poultry supplies! Steinhauser’s has chicken starter feeds, layer feeds and feed for all stages of growth. If you purchased your chicks in the spring it’s now time to switch to a layer feed. 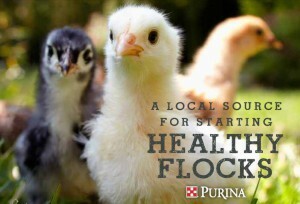 Purina Layena poultry pellets provide optimum nutrition for healthy birds and nutritious eggs. A 16%-protein, high-calcium ration formulated with prebiotics, probiotics and yeast for top-producing laying hens once they reach 18 weeks of age. Find all your chicken supplies at Steinhauser’s! Shop us for lamps, waterers, feeders and more. Come see us! This entry was posted on Friday, January 25th, 2019 at 12:35 pm	and is filed under Events, News & Updates. You can follow any responses to this entry through the RSS 2.0 feed. Both comments and pings are currently closed.